A unique blend of Irish spirits with a sophisticated palate. Hyde No. 6 President’s Reserve is a blend of two, top-quality Irish spirits. It’s approximately 75% eight year old Single Grain Whiskey and 25% eighteen year old Single Malt — both aged in ex-Bourbon casks. The two are married and aged an additional nine months in Sherry casks before being bottled at a pitch-perfect 46%. As you might imagine, all that rather complicated specification limits supply. The current production run is limited to a mere 5000 bottles — so the “Special Reserve” in the name actually means something. The Hyde’s clansman — Douglas Hyde — was the first president of Ireland, serving from 1938 through 1945. 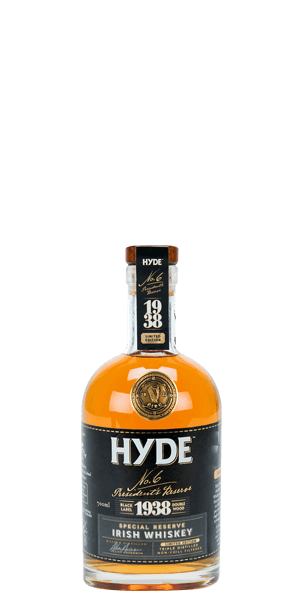 All Hyde “President’s” Whiskies are named after him. What does Hyde No. 6 President's Reserve taste like? The Flavor Spiral™ shows the most common flavors that you'll taste in Hyde No. 6 President's Reserve and gives you a chance to have a taste of it before actually tasting it. Lavender, lemon, plantain, caramel, and oak. Nice and smooth with mixed grain, vanilla, toffee, espresso, and baking spices. Smooth but very spicy. Definitely taste the single malt on this one. Very pleased with this one! Smells nice and tastes great! I love the spice to add some kick to the otherwise sweet taste. I like the long notes of caramel and vanilla. Really smooth. Very enjoyable. The initial burn is a little sharp, but not too bad. Easy to drink. Seems simple but tasted good. Would drink again. Caramel nose, sweet flavor, a little spicy with a coffee finish. Overall a nice whiskey. No consistent flavors in this whiskey. Drinkable but not something I would buy. Good gf doesn’t like it however.